Haeji Kim, born in 1997 and from Michigan, switched from violin to viola at age 16, falling in love with its mellow tones and unique voice. She enjoys playing in an orchestral setting, having participated in the New York String Orchestra Seminar in 2012 as a violinist and in 2014 as principal violist, and finds a certain charm in solo playing, honored to have played with orchestras throughout Michigan. Nevertheless she has always found something special in the art of chamber music and learned more through her time at Caramoor’s Evnin Rising Stars residency and her summer at the Ravinia Festival in 2016. 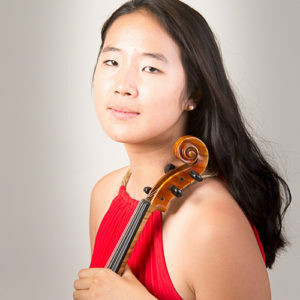 Ms. Kim currently studies at the Curtis Institute of Music with Roberto Díaz, Hsin-Yun Huang, and Edward Gazouleas, and plays on a viola by Joseph Grubaugh and Sigrun Seifert on generous loan from the Virtu Foundation. Ms. Kim credits her studies before Curtis most recently to Caroline Coade, Stephen Shipps, Aaron Rosand & Christina Khimm, and the Vamos’. And through it all, she acknowledges all the glory and praise to her Father in Heaven.